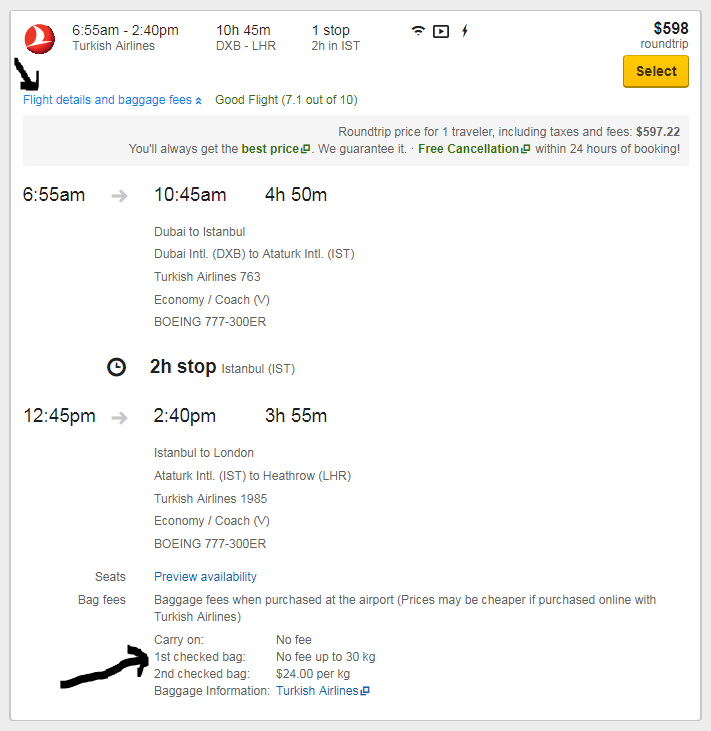 Planning on booking a holiday abroad with expedia.com and was wondering is the fee for checked luggage so the suitcase that you check in covered with the holiday booking? I was under the impression that you just hand them your suitcase or at the kiosk and thats it and if it weighed more than the said limit you then have to pay extra. This will depend on your ticket and airline. There is no rule. You must check the conditions of the fare. When it says you have a baggage allowance of so many pieces, that means that the price includes the cost of checking that many pieces of luggage as long as they satisfy the airline requirement for checked-luggage. You will still pay a fee if there are more pieces or they exceed allowed weight or dimensions. In some cases you can pay extra while some airlines do not accept anything beyond what it specified. It even changes depending on the date so the only rule is to read the airline site regarding luggage allowance. When there is no baggage allowance, you will have the option of paying for checking in luggage. The majority of airlines allow you to take a carry-on and a personal item on board which have some size restrictions and may have weight limit. Some airlines do charge for the carry-on, so you must check the rules associated with the fare you are purchasing. That's not the way it works, there are no general rules and you cannot assume much. It's certainly not a given that a medium to large suitcase is always allowed free of charge (whether as cabin luggage or checked in to the hold). There are also many things you just cannot take with you as a regular passenger and thresholds you cannot exceed even if you are ready to pay a fee. The 23 kg limit is something else, it's a recommended threshold for health and safety reasons as handling heavier weights all day long is dangerous. But some airlines will have a lower limit or won't allow any hold luggage without an extra charge. Others will let you take more than 23 kg of luggage as a matter of course provided it's spread among several bags and many will have different rules for different routes (and/or fares). Many also have a higher “hard” threshold and allow luggage up to 30 kg (e.g. for business class passengers or for an extra fee). When considering a flight or holiday, you therefore have to look for information regarding the specific rules that apply to that specific airline, fare, or package.